Today being Sunday, almost all the shops are closed. I was told this is due to the state's strong Christian background. Lots of tourists out and about though. First stop is Karlsplatz. I got a bit lost and ended up at the doorstep of the Munich Justizpalast (Palace of Justice). Right beside it is a neo-Gothic structure in red bricks. Both these buildings serve as courthouses. To the west is the Stachus, which is what I'm after. After seven years, it still looks the same as I last remembered. Through the Karlstor gate is Neuhauser Strasse / Kaufinger Strasse, a pedestrian walkway connecting Karlsplatz and Marienplatz. Along this passageway are mostly shops and restaurants. As these are closed, I visited the churches instead. First church I passed by is the Bürgersaalkirche (Citizens Hall Church). From the outside, it's hard to tell this is a church. Baroque-style building with a pink facade. An elderly man saw me with my camera, and he beckoned me in. While the ground floor is a three-aisle windowless crypt, the upper church and prayer hall is simply cavernous and magnificent. As there is Mass ongoing, I decided to come back later for pictures. Same goes for the nearby Frauenkirche (Cathedral of Our Dear Lady). Further down the road is Neues Rathaus (New City Hall). More and more tourists are filling up the plaza in front of it, waiting for the performance of the Rathaus-Glockenspiel on its facade. The Glockenspiel comes alive every day at 11am, 12nn, and 5pm. I was just in time for the first performance of the day. After the 15-minute performance, I went back to the churches to take pictures. I found Frauenkirche quite interesting. The church with its twin towers and domes seems to be the tallest structure within the city centre. Turns out that there's a local height limit that prohibits buildings taller than 109 meters in the city center. The cathedral's twin towers are about 98.5 meters in height. Upon entering the church, you'll immediately find the tomb of Emperor Ludwig IV of Bavaria. The crypt below houses the tombs of the members of the House of Wittelsbach. There's an interesting story about the church. It is said that during its construction, the devil made a deal with the architect Jörg von Halsbach that church will have no windows. Halsbach got around that by positioning the columns in such a way that the windows cannot be seen from the foyer, where the devil was standing. When the devil realized that he had been tricked, he stamped him foot with such force that it left an imprint on the entrance to this day. Back at Neues Rathaus, the tourists are back again for the noontime performance of the Glockenspiel. I took this chance go to inside the New City Hall to take pictures. Beside the Old Town Hall (Altes Rathaus) is Peterskirche (St. Peter's Church). Again, Mass is not yet over, so I visited Alter Peter first. For a fee of a few euros, you can climb up this 92-metre tower and have sweeping panoramic views of the whole city. It's a fairly long and steep climb, so be prepared. Also best to come to Alter Peter early because the viewing platform is relatively narrow, and it's hard to move around when there's many tourists. Back inside the church, we see the gilded high altar with the figure of Saint Peter. Mounted on the columns are various sculptures and paintings depicting the Stations of the Cross. Next church I visited is Heiliggeistkirche a.k.a. The Church of the Holy Spirit, located just beyond Neues Rathaus. At this point, all the churches start to look the same to me. This one's got another very impressive high altar by Nikolaus Stuber with Ulrich Loth's "The Effusion of the Holy Spirit" as the altarpiece. The ceilings and columns are done in the Rococo style. Late lunch is a bunch of patries I bought from Rischart. Went back to the hotel to eat the pastries, as I need to rest my legs for a while. Then, it's to Odeonsplatz for more sightseeing. Straight out of the station up to the plaza, you'll see Feldherrnhalle (Field Marshals' Hall) - a loggia containing the statues of military leaders Johann Tilly and Karl Philipp von Wrede on either sides. To the left of Feldherrnhalle is the Theatinerkirche (Theatine Church). The facade may be yellow in color, but inside the church, it's all white. To the left of the Feldherrnhalle is the Hofgarten. 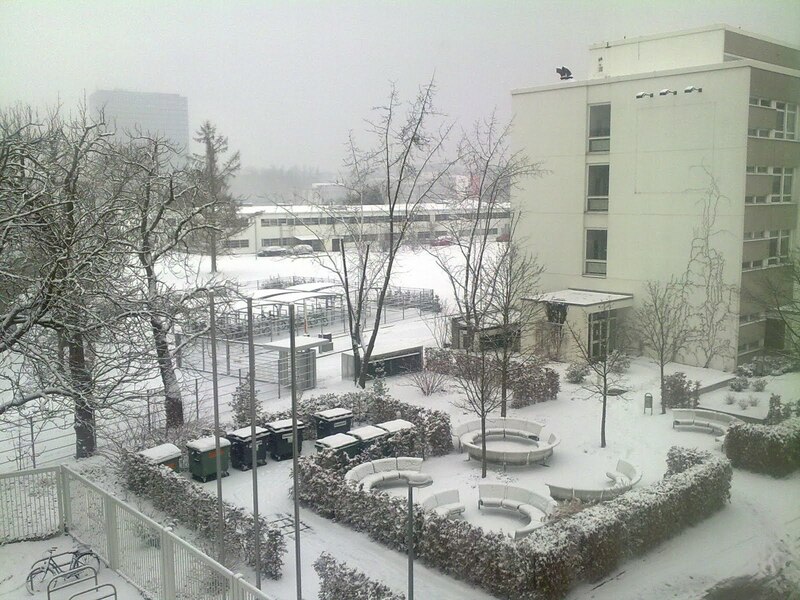 I'm sure it's very nice in spring, but right now, the whole place is blanketed in snow. In the middle of the Renaissance-style garden is a pavilion dedicated to the goddess Diana. There's still enough light in the sky for more pictures, but at this point, my camera batteries gave up due to the cold temperature. Before leaving the hotel earlier, I changed to a different set of batteries. Should've stuck with the old ones. Anyway, with no juice left on my camera, I decided to call it a day. Went to Ristorante Vi Vadi at 7:30am for my breakfast. Turns out it opens at 8am during weekends. Ah, had I known, I would've woken up much earlier and gone straight to the train station. Anyway, after breakfast at McDonald's, I took the 7:52 train. Most of the other passengers are either on their way to the ski slopes or to the castles. Got off at Buchloe around 8:45am, and transferred to another train to Fussen. Arrived Fussen 10am. Waited 15 minutes for the bus, which dropped us off Hohenschwangau at 10:30am. Like I said, should've come earlier. Everybody got off the train in a hurry, and it's a mad dash (a la Amazing Race) to the ticket office through deep snow. I was first in line, yet my "King's" Ticket (€17) is scheduled for 11:50am entry to the Hohenschwangau Castle and 1:50pm entry to the Neuschwanstein Castle. So what do I do till then? Walk around the winter wonderland until the snowstorm blows in, and I had to take cover inside a nearby souvenir store. A few other people had the same idea, so the store started to get busy and crowded. Come 11:50am, the castle entrance flashed my number and with a swipe of my ticket, I went in. Strangely enough, the guys who were behind me in the ticket queue were already there. Must've bought their tickets online. The guided tour of the castle last about half an hour. We were given an audio guide each, and every time we enter a new room, our guide would "activate" our players to play the right commentary using her controller. The neo-Gothic castle was the official summer residence of Maximilian and his wife Maria. He acquired it in 1832 and converted it to what it was today. Ludwig, who would be king, spent his childhood here. Of the many rooms in the castle, the Festaal Hall (a.k.a. Hall of Heroes and Knight) is the largest. The table in the middle of the reception room spans the whole width of the castle. The ceiling has a pink background with silver stars. 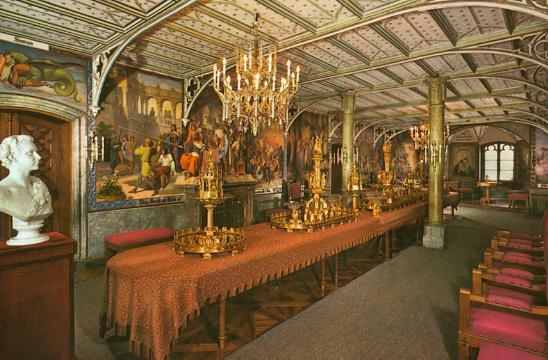 The paintings on the wall illustrate the Wilkina Saga, part of the legends about Dietrich of Berne. Too bad picture-taking (or video) is not allowed within the castle, or else I would've had field day with the 14 majestic rooms. After the tour of Schloss Hohenschwangau, I walked back down to the Ticket Centre. At the Müller Hotel, I took the horse carriage ride up to Neuschwanstein Castle. Normally I would've preferred to walk (even if it's a 40-minute uphill walk). But in the middle of a snowstorm, I'd rather pay €6, and let the horse do the horses do the walking. If you still don't know, Neuschwanstein Castle is the inspiration for Disneyland's Sleeping Beauty castle. Of the three castles that Mad King Ludwig of Bavaria built, this fairytale castle is the most famous. Instead of a proper architect, this castle was actually built by a theatre set designer. And it shows - look at the towers and the spires and the turrets. King Ludvig II must've been a forward-looking guy. This castle was fitted with many modcons that would be quite modern for 19th century. There was running water on all floors. Quite convenient as the spring that supplies drinking water to the castle is just 200 meters above it. There were toilets with automatic flushing on all floors. There was warm air heating system for the whole castle. There was a hot water system for the kitchen and bath. There was a phone line installed. There was a paging system, so the King can get assistance from any room within the castle. Most notable of all the rooms is the Throne Hall. The room is two storeys high, inspired and designed in the style of the Hagia Sophia in Constantinople (now Istanbul). 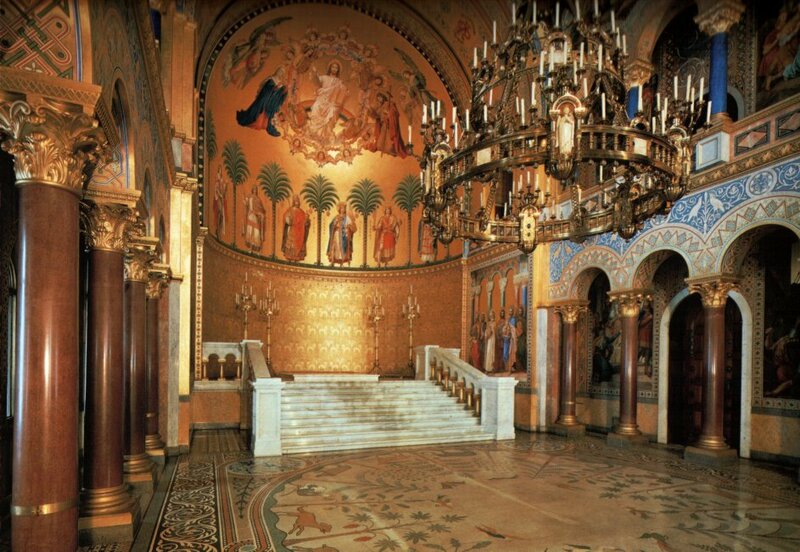 The huge chandelier with fake jewels is supposed to look like a Byzantine crown. The throne dais is surrounded by painting of Jesus, the twelve apostles and six kings. However, the actual throne is missing, as King Ludwig II went bankrupt at this point in time. Too bad. His bedroom is not too shabby either. The king's bed is in the neo-Gothic style with intricate carvings. It is said that 14 master carvers worked for 4.5 years on the carvings in the bedroom. A secret door leads to the toilet. 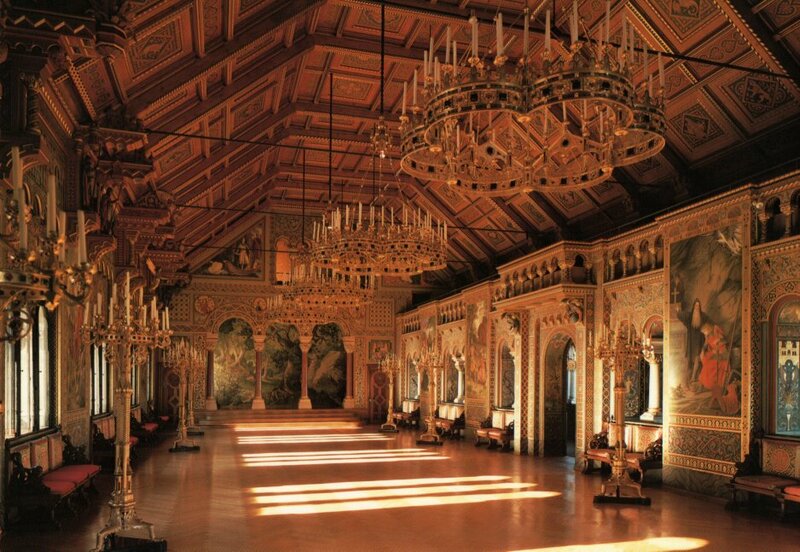 The Singer's Hall is the biggest room in the whole castle, said to be patterned after the Minstrel's Hall of Wartburg Castle. The first performance in this hall was in 1933 with a concert commemorating the 50th anniversary of Wagner's death. Outside the castle, the snowstorm has stopped, leaving behind a thick layer of fresh snow. I would've liked to take a hike to Marienbruecke (Mary's Bridge), but the entrance is closed and locked. Never stopped me (and others) before. After half an hour of trudging through steep and slippery snow, I finally got to Mary's Bridge over the Pollat Gorge with a magnificent view of the Neuschwanstein Castle sitting on top of a rugged hill. Very cold and very windy. Took a few quick shots and headed back to the town centre. I've got half an hour to spare before the bus arrives at 4:40pm, so I went in the nearest restaurant I can find and had a quick late lunch - pork cutlet Vienna style with fries and salad (€9.80) and tomato soup (€3.20). Got back to Munich round 7pm already. Spent the past few nights shopping at Marienplatz. There's really not much else to do. Given a choice, I'd rather be taking pictures. However, by the time our training course finishes at 4:30pm, and by the time I get back to the hotel, it's already quite dark. Rather than have shaky, fuzzy pictures, shopping it is. Today being the last day of the NG course, I took the chance to drop by the tourist information office at Hauptbahnhof and inquire about their Neuschwanstein castle tour. The lady told me that it's €49 for a whole-day tour. She said the tour covers Neuschwanstein Castle and Hohenschwangau Castle, plus a tour of a nearby village. She also mentions that if I go to Hohenschwangau on my own and buy my own ticket, that'll give me entry to only one castle. I'm not too sure about this, so I asked the lady if the can provide me a brochure detailing what is included in the €49 tour. She said she can only give me the information once I've signed up for the tour. Sounds funny to me, so I said no. I figured that €49 probably doesn't even include the admission fees to the castles. Being an adventurous guy, I decided to do it on my own. Went to a DB ticket machine and bought a Bayern Ticket Single for €20. That gives me access to rail and bus transport throughout the whole of Bavaria. The plan is to take the train from Hauptbahnhof to Fussen, then a short bus ride to Hohenschwangau. For tonight, I gave Marienplatz a rest and went to OEZ (short for Olympia Einkaufszentrum) instead - the largest shopping mall in the whole of Munich. So many shops to check out - Esprit, Zara, H&M, C&A, Karstadt, Galeria Kaufhof, even Woolworths! If ever you lose baggage while traveling with Emirates (or any airlines for that matter), don't bother calling them. From my experience, the phone is either always busy, or no one is answering the phone. Go here instead: http://www.worldtracer.aero/filedsp/ek.htm Found that link after a bit of online sleuthing. After entering my reference number, the website tells me that my baggage has been found and on its way to Munich. Didn't say when though. When I got back to the hotel that night, my luggage is already in my room waiting. Never did I get any call from anyone regarding the status of my luggage. Oh, well. Spent the night unpacking my stuff and writing postcards. Woke up in the morning to find everything blanketed in snow. Went to reception to get some toiletry kits, a Nokia phone charger, and breakfast vouchers for the week. Buffet breakfast only so-so. Mixed fruits, cereals, fruit juices, croissants, scrambled egg, egg roll, ham and cheese, etc. Nothing to write home about. Supposed to take the U5 to Heimeranplatz, then transfer to S7 going to Siemenswerke. When I got to Heimeranplatz, I didn't see any S-Bahn S7 nearby. After a few minutes of walking around, I decided the best option is to go back to Hauptbahnhof and start from scratch. That's when I saw a sign (inside the station) pointing towards S7. Near Siemenswerke, I got lost again. 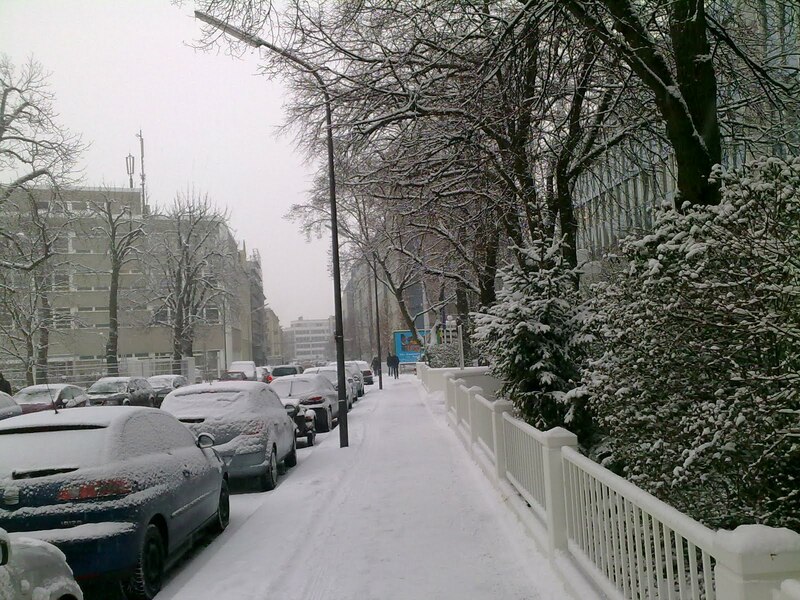 I saw a big block of office buildings on the left, so I thought that must be it. That's where most people are going anyway. At the metal revolving gates, people are using security passes to get it. So I circled all the way to the other side of the block to get to the main reception. Turns out the training centers are on the other side of the tracks. One good thing about this frigid winter is that you can be walking for half an hour, but you're not sweaty. After training, I dropped off my stuff at the hotel, and went straight to Marienplatz for some shopping. I've been wearing the same clothes since I left Sydney, and I really need a change. If you're not too fussy about fashion, and just want clothes to wear, you can't go wrong with H&M. Not too pricey. There's at least three outlets one beside the other in Marienplatz. Also nearby is the Galeria Kaufhof department store. Currently having massive clearance sales, so this is the right time to do some last-minute winter shopping. If you really want cheap, go to C&A. So much stuff to buy, but I don't want to buy too much, as I'm not sure if Emirates is going to reimburse me or not. Tried calling them at noon, but no one's picking up. Isn't it amazing how you can fly out of Sydney in the morning, arrive in Munich at night, and still log 21 hours of flying time; not including the 3-hour transit time in Dubai? Ah, the wonders of time zones. This is the first time I'm flying with Emirates, and I'm quite impressed with their planes. The seats come with widescreen displays. They're touchscreen, too. Great selection of movies, TV shows, documentaries, audio CDs, and games. You can watch any movie from the start any time. There's an AC outlet, USB port, and an Ethernet port. When it's time to sleep, the whole cabin goes dark, and the (fake) stars come out. With a whole day (and night) to kill, I started watching movies. Lots of them. In the first Death Note, Light (Kira) sacrificed his girlfriend in order to escape L's suspicion. This time, he got a new partner, Misa. She's so enamoured with him that she volunteers to do his dirty deeds. With much scheming, Light finally finds out L's full name. He writes it down in the Death Note, and L drops dead. Amazingly, L later comes back to life to confront Light. Turns out that L has already written his own name in the Death Note beforehand, indicating how he'll die and when. When someone is already "dead", they can't be killed again, so Light's later entry didn't have any effect. With this ultimate sacrifice, L manages to expose Light as Kira in front of everyone. Game over. To celebrate its 50th anniversary, Fuji TV presents Amarufi: Megami no hôshû. 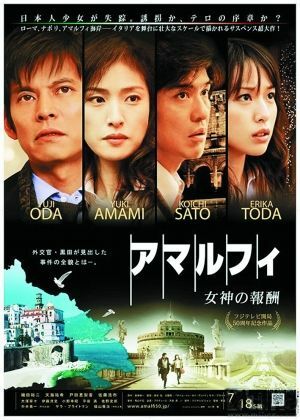 Shot in Rome and the coastal town of Amalfi, the film has enough big stars to guarantee a blockbuster. Didn't work for me though. As with most movies shot on foreign locations, this one tends to be dragging and feature too much of the local landmarks, which distracts the audience from the plot. To give the movie a brooding feel, most of the scenes are quite dark. Another complaint is the single mom's character. She's always panicking and not following instructions, I would've dumped her if I was the inspector. Some of the climax scenes are a bit unbelievable. The bumbling mom pulling off a last-minute double-cross (with a gun)? An international gang of volunteers successfully barging their way into a private Sarah Brightman concert for the President and Ambassador? Come on. 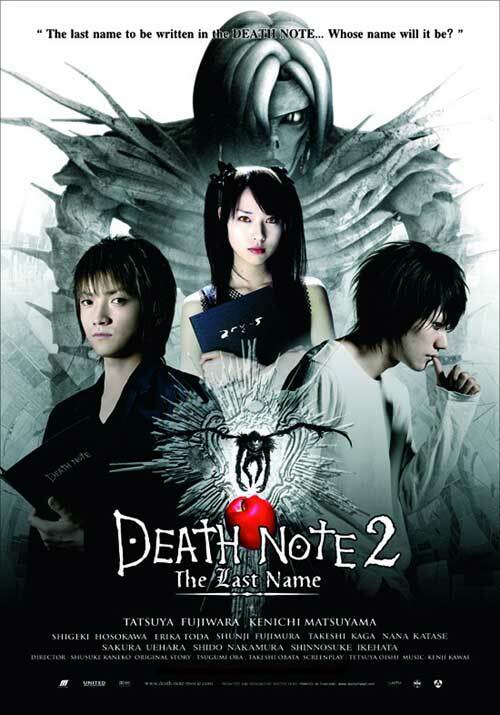 When this Japanese movie first came out, it was shown on 428 screens, seen by a million people in its opening weekend, and earned more that 1.2 billion yen. I watched it on the plane and switched to another movie after half an hour or so. Am I missing something or what? How is this supposed to be good? Maybe the manga series from which this movie is adapted from is very popular? First part of the movie is mostly character introduction and development. 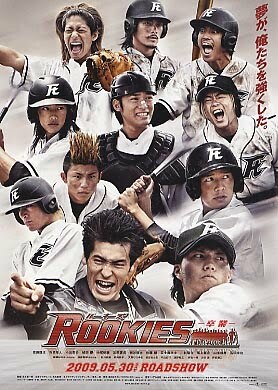 It shows a bunch of high school kids messing around, and looking for recruits for their baseball team. All the guys are just trying to act cool. The acting was so over-the-top, it really turned me off. From the makes of Spy Kids, another over-the-top movie. At least it's in English, so I can understand it better. The movie is chopped up into a series of shorts, hence the title. 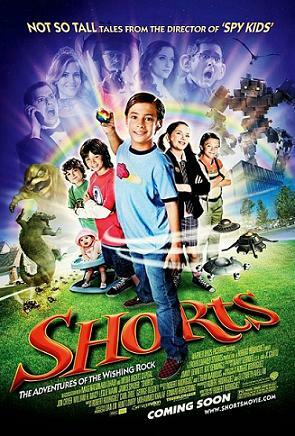 Movie is about a boy who discovers a wishing rock. He makes a crazy wish. Through the magic of computer animation, it comes true. He discovers his wish is not too good, so tries to fix it with another wish, which makes things worse. The wishing rock gets passed on from person to person, resulting in crazier and crazier scenarios. In the last scene, the superintelligent baby gives a sermon to everyone for their petty wishes, so they get rid of it. Happy endings for everyone. Said to be Wong Kar Wai's most underappreciated work, I now see why. The movie has no plot. Lots of big-name stars like Leslie Cheung, Brigitte Lin, Maggie Cheung, Tony Leung Chiu-Wai, Tony Leung Ka-Fai, and Jacky Cheung, but the movie makes no sense whatsoever. 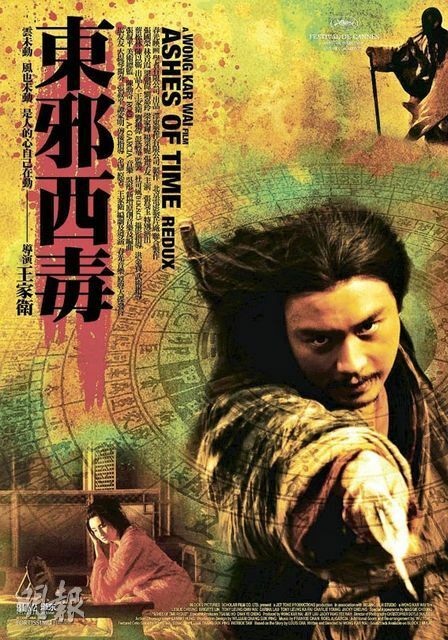 Heck, the characters came from Jin Yong's The Legend of the Condor Heroes, but the plot has nothing to do with the book. Maybe if I'm in a philosophical mood, I'll revisit the movie again, but not when I'm on a plane feeling sleepy. Arrived at Munich airport around 8:15pm. The baggages come and go, more flights come and go. No sign of my luggage. By 9:30pm, I had to accept that it's lost, so I filed a Property Irregularity Report with baggage services. Good thing I had gloves, a scarf, and a jacket in my backpack. Bought a train ticket to the city and a weekly pass for tomorrow and left. At Ostbahnhof, everybody started getting off, so I followed them. Now I've been to the Munich central train station before, and it doesn't look like this. Was there a major renovation work in the past few years? No one seems to know where Marsstrasse is, even though I know it's only a few hundred meters away. Braving the cold winter night, (no snow in sight though), I stepped out of the station and walked around looking for my hotel. This is definitely not the central station. Got back inside the station and sought help from a group of policemen standing around. One word: Hauptbanhof. Not Ostbahnhof. By the time I get to Ostbahnhof and to my hotel, it's already 11pm. And guess what, reception's closed. Had to ring some bell and get checked in. Took advantage of eBay's free-listing-fees promo post-NY, and put up a few bargains last week. Today I'm reaping the fruits of my efforts. First few days of the auction were tough because one of the conditions is that you had to list at $0.99. Days would go by with no bites whatsoever. Then a few watchers, but no bidders. Then one or two bidders, but the bid seems to be stuck at $1 or so. I mean, guys, these are brand-new Swatches we're talking about! Few hours to go, the bids start coming in. The hammer falls, SOLD! I bought these Swatches a couple of years ago, but never got the time (get it?) to wear them, as I have a few other Swatches I'm rotating. IIRC, I bought them for around US$20+. 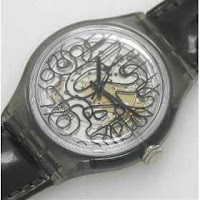 The automatic Numé-Rotation (SAM107) with see-through front and back sold for $31, while the Extra-Thin (GK326PACK) that comes in special foil packaging sold for $21.50. Not too shabby. My white Nokia AC-1A compact travel charger with retractable cord sold for $0.99, which is a pity, but what can you do? The postage of $5.70 costs more than the item. The other black charger didn't even get one bid. With eBay, you gotta know what to sell and when to sell. Try not to end the auction in the middle of the night because by then most of your bidders are asleep. This sounds obvious, but don't sell something you don't want to buy yourself. I'm currently trying to sell some audio CDs and Xbox and PS2 games. Very little interest. I reckon some guy's gonna snag some real bargains here - $0.99 item price with $3 handling and postage. Thar's Gold in Dem Thar Garage Sales! The other time we were driving along Burwood Road, and we saw this household having a garage sale. Found this charger which worked with my sister's dying TomTom One, which extended its lifespan a couple more years. 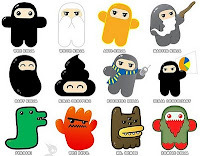 Created by Shawn Smith of Shawnimals fame, Ninjatown is a defense strategy game. The bad guys move through a section of the town. 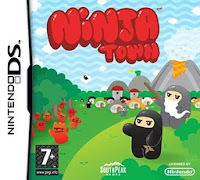 You construct ninja huts along their path, from which different types of ninjas will emerge to engage the enemies. For every enemy that crosses the town, one life is taken out of your 10 lives. For every enemy that you defeat, you gain ninja star cookies, which you can use to build new huts or upgrade existing ones. You also earn Happiness points, which you can use to execute special moves. The ones I usually use is the magnifying glass to burn the enemies or blowing into the mic to "push" enemies to a certain direction. After going through so many levels, the last stage wasn't as difficult as I expected. Remember to make use of the lava ninjas (once unlocked). These guys strike hard, but are not hardy, so construct modifier buildings to increase their range and regeneration. Took down the Boss even before he got to the middle of the map. Yeah! By the way, the PS3 Singstar microphones came in today. Just need to download more Singstar songs and videos and let Ultrastar Deluxe work its magic on the Windows laptop. I'll probably test my new(ly bought) refurbished Xbox on the weekend. Hit the Bankstown Markets early in the morning in search of a spare tyre (and wheel). My brother was tipped off that he might find his stolen spare tyre there. Saw this wooden rocking chair that I really wanted. Ought to be really handy when the wife gets bigger. The asking price is $30. CHEAP! We're not leaving yet, so we decided to buy it when we're about to leave. We didn't find any tyres. Got back to the seller, and guess what? Somebody has already put a deposit on the rocking chair. The lady was willing to give the chair to us, if the buyer still didn't show up after 15 minutes (on top of the 30 minutes already passed). Too bad, she showed up on time and finalized the purchase. Moral lesson to self: If you see something you like, buy it immediately. Where else to get good bargains? DFO. Puma was having a 40% storewide sale. The wife got herself a white shoulder bag, while I got a new pair of Puma Scattista Lo Speed Racer sneakers. 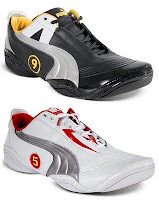 Puma specially created these shoes to tie in with the Speed Racer. The Scattista Lo Speed Racer M5 (white) is modeled after Speed Racer's car, the iconic Mach 5. while the Scattista Lo Speed Racer X9 (black) reflects the film's mysterious character, Racer X. Both racing sneakers incorporate Puma's UNI construction in which the shoe's upper is sewn directly onto the sole, providing stability, weight reduction and and good fit. Guess which one I bought? Would've gone on to Ikea after dinner at Phoenix for more shopping. Too bad it closes early during weekends. It's HOT, HOT, HOT! Not the festival itself, but the weather. It was so hot, we didn't even wanna step out. The Festival First Night actually started at 2pm at Hyde Park, but we waited until 8:30pm when things have cooled down a bit before we left the house. Walking from Wynyward to Martin Place, you see all this huge mass of people just wandering about. Most of them are teenagers, and a bit too excited for my liking. Well, the wife can't walk far, and we have no intention of staying long in the CBD. So the plan is to head to Circular Quay first to take pictures of the Bridge with the yin-yang sign. Then to Macquarie Street for the Light Walk. Back to Hyde Park to see whatever performances are on, then home. Got to Circular Quay, no yin-yang sign on the Bridge. I guess the city is intensifying its efforts to go green and cut power consumption. Macquarie Street - no special lighting on the building facades. We did catch a Scottish band performance in front of The Mint. We noticed a sign saying that The Domain is already closed. I still don't understand why so many people want to see Al Green. At Hyde Park, there's just too many people about. Some of the kids are starting to get rowdy, so we decided to call it a (Festival First) Night. Got a few Thinkpads lying around the house, so I thought it's about time I fixed them up. I've got a proper working 600E with a 6GB hard disk running Win2k. 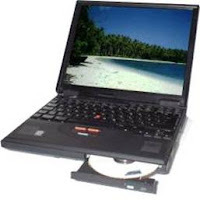 Then I have a T23 with no hard disk. Might as well use the laptop with more processing power. So I ported over the 6GB HDD to the T23 and changed the OS to a barebones TinyXP (with all the drivers, of course). After the fresh install, I'm left with 3.4GB free. Not good. Switched back to WinXP patched all the way to SP4. Ended up with 4GB free. Not bad. 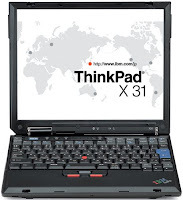 Then there's the X31 with 1.7GHz CPU, 512MB RAM and 40GB HDD. Only problem is, the WiFi is not working properly. It works for a few minutes, the cuts off by itself. I managed to get hold of a non-working X31 and swapped the Intel WiFi modules around. Voila! A working svelte X31.